We take songs that are well-loved, time-honored classics and make them our own. We give them a new twist so that they can be enjoyed all over again with a fresh hip sound. We are a trio that has written original music as well as covered a wide variety of popular songs. We play everything from the Beatles to Radiohead in a unique style of a West African Djembe Drum meets 3-part Harmony meets Laid-Back-Funky-Island Guitar & Bass. We can provide our own quality QSC sound system that can handle 250-500 people. We are also happy to travel lighter and plug into your sound system. We have enough material to entertain for 3 hours. We have played festivals, fundraisers, weddings, corporate & private house parties, various events & venues around Pittsburgh including the PGH Arts Festival, the PGH Marathon, Mr. Smalls Theater, Hard Rock Cafe, Club Cafe, and various bars and restaurants around the Pittsburgh area. Thank you for considering us for your next event. We look forward to hearing from you! *We have also been known to jam with Jason Freyer, Brian Reed on drums and Justin Cipriani on Congas. Corinne and Ed began performing together as Jupiter Vinyl in August 2010. Their music is reminiscent of a modern day Johnny Cash and June Carter. Their new and interesting style grew out of their very different backgrounds. Ed hails from just south of Pittsburgh, PA, a city that is experiencing an exciting renaissance of music and art. He has studied guitar and piano for over 30 years. Ed founded Paint Can Records an independent record label that’s been producing music since 2002. He’s released several albums ranging from solo classical guitar to indie rock and teaches private guitar and piano lessons. His gifts lie in composing music to lyrics and controlled, yet highly sophisticated, guitar rhythms and melodies to the table. Corinne, on the other hand, is from the small rural town of Marquette, MI, where she camped, hiked, fished and enjoyed an active lifestyle in the wilderness of the Upper Peninsula. She grew up singing in school musicals, competing in state honors choir competitions and was a member of the University of Michigan Glee Club. Her musical style was also influenced by the summers she spent singing around campfires along the beautiful pristine shores of Lake Superior. Her gifts lie in playing the bass, mandolin, and writing and singing unique harmonies. In 2012 Jen Webster began performing with Corinne and Ed. 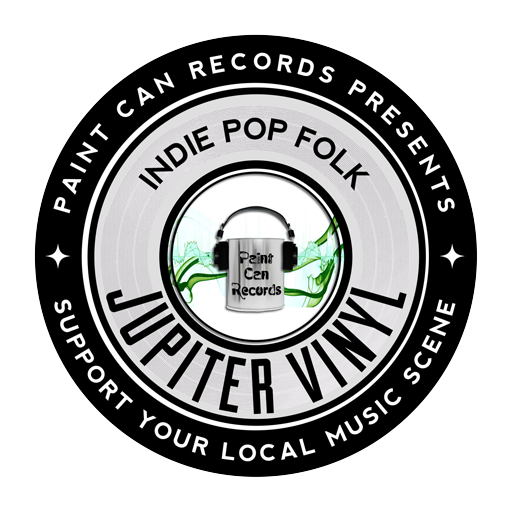 The addition of Jen’s vocal harmonies and rhythms round out Jupiter Vinyl’s upbeat indie-pop-folk sound. Jen hails from just north of Pittsburgh. She has studied drums, bass, guitar, and vocals for 23 years. She grew up in a house that was always full of music that formed the basis of her musical influences. She enjoyed singing along to folk tunes with her mom.